What are nudges in Outlook? 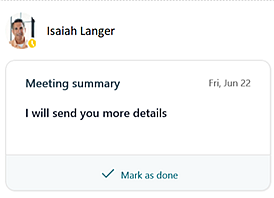 Nudges in Outlook (or Insight nudges) are brief data and AI-driven notifications that appear in Outlook while you are either reading or composing an email or a meeting invitation. Insight nudges can help boost your productivity and that of your team by displaying useful suggestions, tips, and best practices around managing email and running meetings. They help inform and guide you in making effective email and meeting decisions. They can also help you reclaim focus hours and build better collaboration habits, in addition to other practical benefits. Types of nudges lists some of the nudges you might see in Outlook. Insights can display nudges in the following ways. While composing a meeting invitation or an email. In this example, the nudge is shown at the top of an email, reminding you of the after-hours impact you’ll generate for your colleagues. The nudge suggests that you clarify the email's urgency, so that recipients know if it can wait until working hours. Alternatively, you can hide the nudge temporarily by selecting Dismiss this message. While reading an email or a calendar invitation. While reading an email, this nudge reminds you of a potential outstanding task item for the email sender. Selecting the link takes you to the Insights Outlook add-in, which shows the list of task items. Why don’t I see any nudges? Insight nudges are available in the latest versions of Outlook for the web and Outlook for Windows with Microsoft 365 or Office 365 licenses. 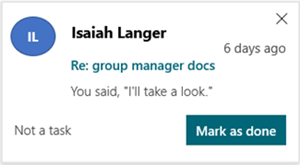 In Outlook for Windows, nudges will show up while reading or composing email and while you have a meeting invitation open. In Outlook for the web, only nudges while reading email and meetings are available at this time. Nudges are not currently available in Outlook for Mac, Outlook for iOS, or Outlook for Android. 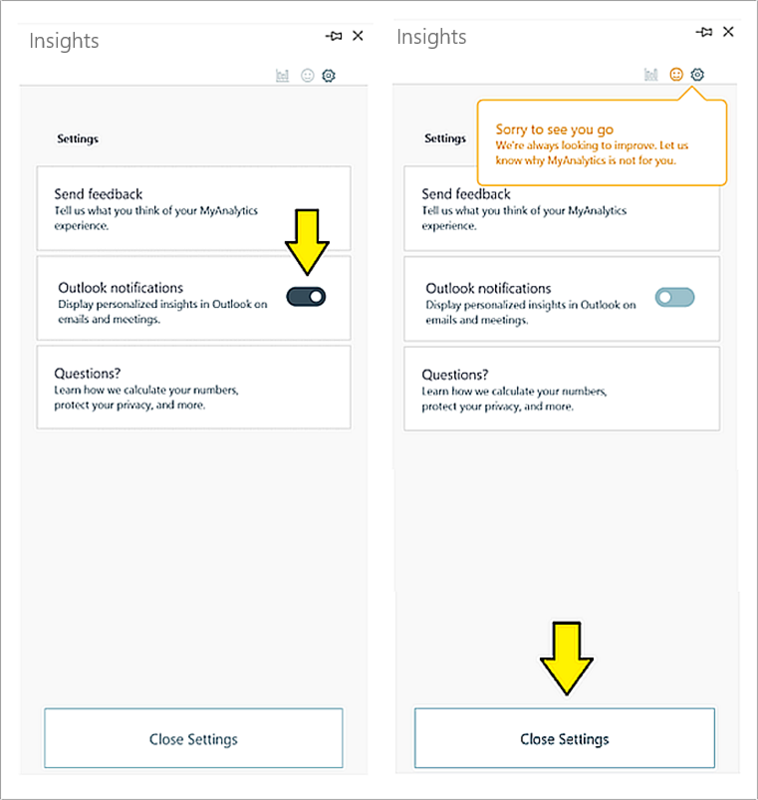 You can provide feedback for each nudge by using the feedback control at the bottom of the Insights Outlook panel. If you send a thumbs down, we’ll show you less of that nudge. You can always provide overall feedback by selecting the smiley face in the upper-right corner of the Insights Add-in panel. 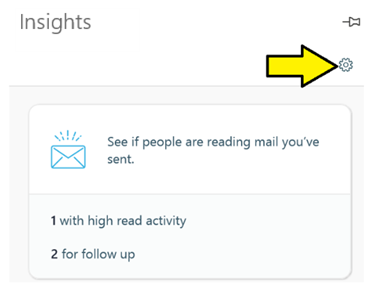 To opt out of MyAnalytics nudges, select the Insights icon on the Outlook Home ribbon. If you are using Outlook on the web, the Insights icon is in the top right corner of the reading pane, or in the bottom right corner of the compose form. Select the gear icon to access Settings. In Settings, turn Outlook notifications to Off, and then select Close Settings. The following are a few of the nudges you might see in Outlook. Reading pane (meeting invitation) This meeting conflicts with your scheduled focus time. Do you want to move your focus block? See available times Helps you to protect your focus time block, by suggesting that you move a booked focus session to another time when a meeting request conflicts with it. Reading pane (email) You may have outstanding tasks for sender. Would you like to review now? See my tasks Reminds you that there might be outstanding task items for the sender. Email compose Your colleagues have been responding to your mails outside typical working hours. Consider clarifying urgency Suggests that you clarify the degree of urgency when emailing colleagues outside work hours. Email compose There are some open times during your working hours to catch up on email. Book time Suggests that you book time during the day to do email instead of catching up after hours. Meeting compose This meeting is outside typical working hours for attendees. See times Suggests nearby meeting times within working hours for all meeting attendees. Meeting compose Could this meeting be 45 minutes? Build in some buffer time and save attendees time. Shorten meeting Suggests that you shorten hour-long meetings to 45 minutes.